Smart, Safe and Tough! 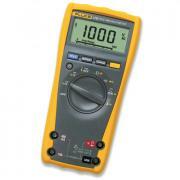 The New 170 Series Fluke Digital Multimeters are all three. And, no other meters offer such performance at such a great price. Introducing Fluke 175 & 179 Series Digital Multimeters, Fluke's smartest, safest and toughest meters inside and out. 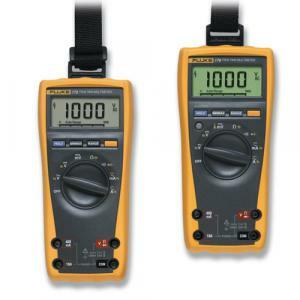 The 175 & 179 series meters feature tougher body armor, 6000 count resolution display, auto and manual hold, lifetime warranty and are designed to meet the IEC 1010 Safety Standards to CAT IV 600V and CAT III 1000V. These meters are internally tough with fused current inputs, overvoltage protection and they even protect against measuring voltage if the knob is accidentally set on ohms. On the outside the rugged overmolded body armor case offers constant protection no matter how much you throw them around. For those with accuracy concerns the Fluke 170 series meters are more accurate than ever and have an easy-open battery door where the battery can be changed with out breaking the calibration seal, preventing unnecessary calibration charges. For overvoltage protection against transient spikes up to 6 kV, and has the safety ratings to prove it. Protect yourself and your technicians working in dangerous environments like three-phase distribution systems such as: single phase commercial lighting, equipment in fixed installations like switch gear and polyphase motors, bus and feeder in industrial plants, lighting systems in larger buildings and appliance outlets with short connections to the service entrance. The 179 is loaded with features including temperature measurements in Cº and Fº (Thermocouple included) and a backlight for measurements in low visibility environments. Accurate even when harmonics are present, true RMS, automatic Touch Hold ©, auto/manual range, Lo Ohms with zero calibration, continuity beeper, capacitance, diode test, volts, amps, resistance, frequency counter and sleep mode, 6000 count resolution with bargraph. Includes test leads, 9 volt battery, user's manual and a lifetime warranty. Every bit the meter the 179 is but without temperature measurements and a backlight. The 175 features a 6000 count resolution, .15% accuracy, Min/Max/Average, True-rms, ac voltage and current and is CAT IV rated. Also Touch Hold ©, continuity beeper, diode test, volts, amps, resistance and sleep mode, Includes test leads, 9 volt battery, user's manual and lifetime warranty. NIST Traceable Calibration Certificate for Fluke 175 and 179 Digital Multimeters are available for $100 per Calibration Certificate, call 800-284-0808 to order. 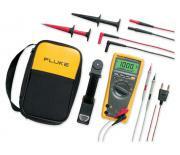 This value priced combo kit from Fluke features the popular Fluke 179 True RMS DMM combined with a Deluxe Accessory Kit and NEW Soft-sided storage case! The Deluxe accessory kit includes our most popular collection of test leads: Silicone Test Lead Set; small profile, fine tipped Electronic Test Probes; A set of Heavy Duty Hook Clips; an Integrated Temperature Probe ( -40º to 260ºC, -40º to 500ºF); plus a ToolPak(TM) magnetic meter hanging accessory, all in a compact, durable Soft-Sided Case. The 179 is loaded with features including temperature measurements in ºC and ºF (Thermocouple included) and a backlight for measurements in low visibility environments. Accurate even when harmonics are present, true RMS, automatic Touch Hold ©, auto/manual range, Lo Ohms with zero calibration, continuity beeper, capacitance, diode test, volts, amps, resistance, frequency counter and sleep mode, 6000 count resolution with bargraph. Includes test leads, 9 volt battery, user's manual and a lifetime warranty. Description: Every bit the meter the 179 is but without temperature measurements and a backlight. 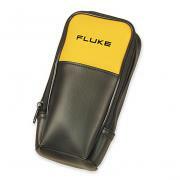 Description: Soft-Zippered Vinyl Case accommodates all Fluke 11x and 70 series multimeters. Dimensions: 8" x 3.5" x 2.5"